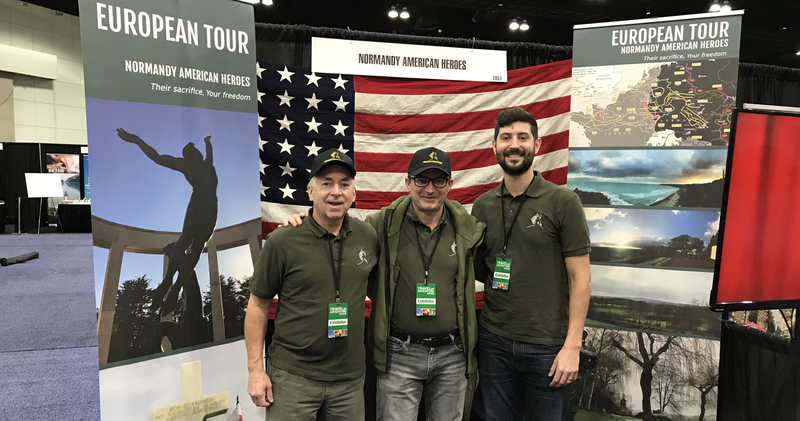 Above, BlueWing's Steven Aguiar (right) with Normandy American Heroes founder Rudy Passera (center) and US sales representative Steve Judd (left) at the 2018 Los Angeles Travel and Adventure Show. In the late summer of 2016, Rudy Passera approached BlueWing with a vision for his passion project. Rudy provides sweeping historical World War II-themed tours of Normandy. At the time he was largely supporting himself with income from a separate job, but he thought he could grow his tour business with the right marketing and sales structure. Less than a year later, Rudy’s vision came to fruition. Increased awareness led to a flurry of new tour reservations. The uptick in bookings brought a wave of money into the business. And at last, Rudy left his other job to focus exclusively on Normandy American Heroes tours. "It is awesome to be able to focus full-time on my business. I didn't think it would be this quick," says Rudy. BlueWing worked hand-in-hand with Rudy to execute a strategy driven by our expertise yet based on his knowledge of the business and familiarity with his target customers. Overall, we’ve helped Rudy generate 784 new leads for his business and 44 new customers. "Before I signed with BlueWing, I probably had close to zero inbound leads and no tools to measure the leads coming through my website," says Rudy. "Now I get close to 100% of my business through inbound marketing, with maybe 5% coming through a mention of my business in a Rick Steves tour guide and referrals from previous guests." The results of Normandy American Heroes’ inbound marketing campaign are remarkable. They are also repeatable. Above, contact referral sources for Normandy American Heroes from October 2016 to March 2018. A great inbound campaign will still fail if the customer arrives on a website that’s not optimized for conversions. BlueWing’s first step with Rudy was to overhaul the Normandy American Heroes website. By redesigning the site from scratch and establishing HubSpot as the backend, we were able to set up a seamless user journey and give Rudy the tools to track and manage all leads who visited the site. 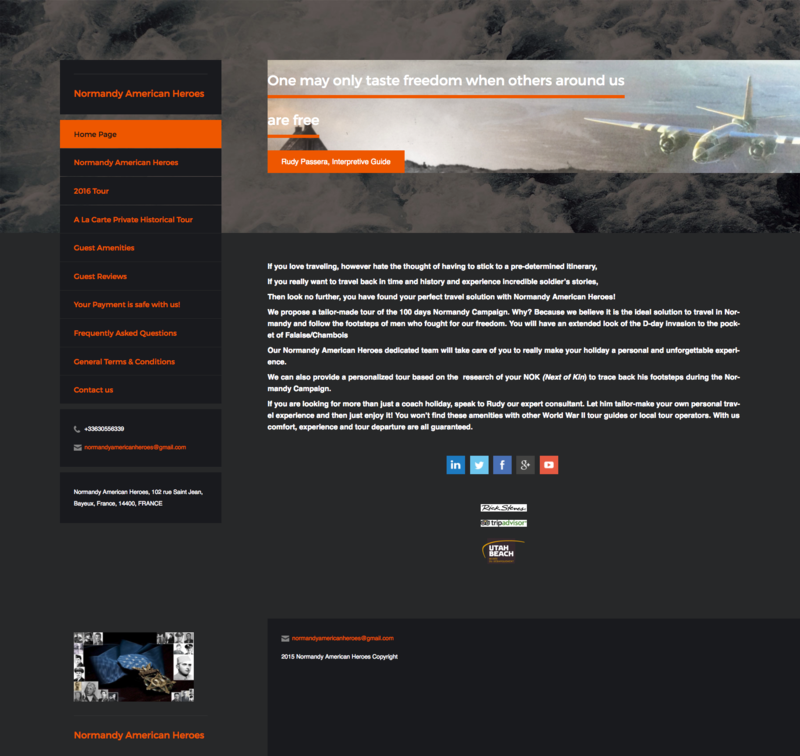 Take a look at the homepage on the old site below, and the new homepage right here. As a Hubspot partner agency, BlueWing is uniquely positioned to provide clients with best-in-class tools at the right price. For Normandy American Heroes, Hubspot facilitates contact and lead management, conversion path optimization, marketing automation, ad spend ROI measurement, and sales process organization. 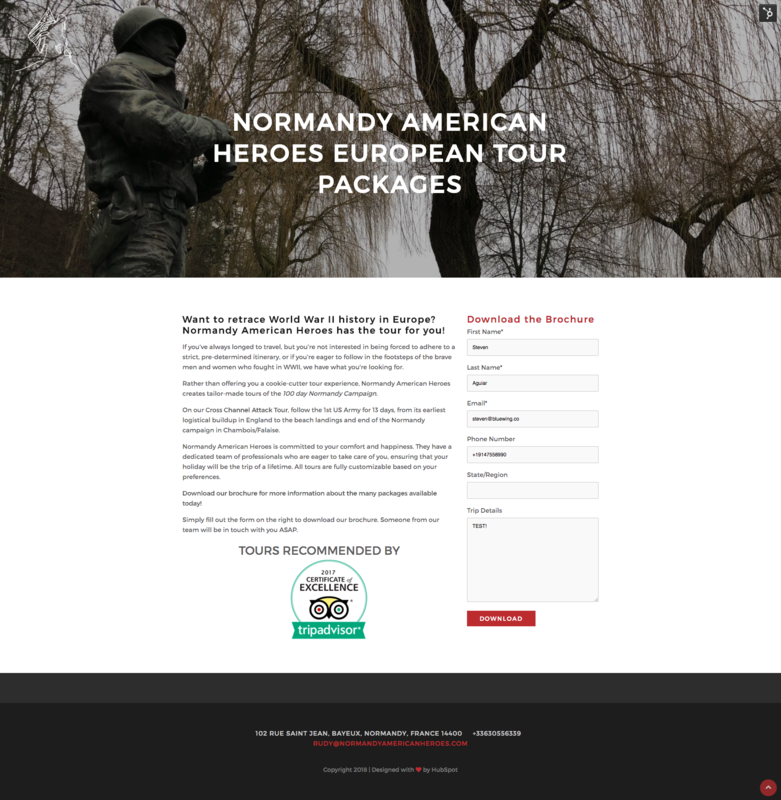 With a digital presence set up to engage and convert visitors, Normandy American Heroes could really “open for business.” It was time to launch the campaign. The blueprint for a successful accelerated inbound campaign is the buyer journey. A company must provide value at all three stages of that journey—awareness, consideration, and decision—to convert a target into a customer. Providing value, for Normandy American Heroes, meant translating Rudy’s knowledge into content for consumption by potential tourists; and more specifically, creating the right content for the right potential tourist. Working closely with Rudy, BlueWing developed two target personas for Normandy American Heroes: The History Buff and The Trip-Planning Matriarch. The inbound campaign would be built based on these potential buyers’ journeys: first, understanding what each is searching for on the topic of a Normandy tour and second, designing a downloadable piece of content based on the target persona and their stage in the buying journey. Wants a guide with deep knowledge to provide a nuanced tour. Trip-Planning Matriarch Wants an experienced and reliable guide for her family’s vacation. Initial content offers are designed to engage potential customers in the “awareness” stage, when they’re just looking for broad information. In the development and promotion of Normandy American Heroes’ initial content offers, it was again a combination of BlueWing’s expertise and Rudy’s knowledge of the subject that brought about rapid results: Normandy American Heroes now appears on the first page of search results for every target keyword listed in the table above. BlueWing researched and selected the keywords, using HubSpot, and Rudy wrote the content offers for the site based on the key search terms. With a few tweaks to the posts for search engine optimization by BlueWing, the content was ready for Normandy American Heroes’ target customers. Above, a top-performing landing page we drive traffic to with Google AdWords and calls-to-action across the Normandy American Heroes site. Once visitors to the site gave Normandy American Heroes their email addresses, they became leads, potential customers who have indicated clear interest in what Rudy is selling. HubSpot allowed Rudy to see which pages of his site a lead had visited, whether it was a specific blog post or tour package. He was able to customize his sales outreach accordingly. BlueWing helped Rudy develop and target these leads with content offers tailored to the second and third phases of the buyer journey: consideration, when the lead is mulling a few options for what they want to do in Normandy, and finally decision, when the lead is prepared to book a historical tour. In this campaign, we used the same consideration and decision-stage content offer for both targets in retargeting efforts. Normandy American Heroes’ AdWords campaign launched in May 2017, targeting people searching for “tours in Normandy” and related terms. When the month ended, we’d spent $913 on the ads. This brought in 409 clicks to the landing page ($2.23 CPC), 57 leads who entered their emails ($16.03 CPL), and six deals closed. The value of those six deals? $16,360.96, or a 1,692% return on investment. Google Adwords, the gasoline on a well-optimized inbound marketing campaign, continues to be the big driver when it comes to generating leads for Normandy American Heroes. Of the 784 leads now in Rudy’s database, 605 came from AdWords and 79 from organic search. The rest are scattered between email, referrals and direct traffic. Given the success of this inbound campaign for Normandy American Heroes to date, BlueWing and Rudy have decided to apply the lessons learned to a new initiative: targeting people looking for longer tours of France and nearby countries, like England. Longer tour bookings, naturally, translate to more profit for Rudy, whose passion project has transformed into a thriving business. Just during the first two weeks we’ve begun targeting people searching for longer “European World War 2 tours,” Rudy has generated 8 leads from this campaign. Just one person on a longer 5-10 day tour is worth $5,000 to $10,000. One lead usually reaches out on behalf of two to four people. (In one case, 32 people.) You can do the math from there! "Inbound marketing has exceeded my expectations. Steven of BlueWing has clearly understood the vision of Normandy American Heroes," says Rudy. "I envision a long-term partnership of trust, team work and financial results for both companies."